In the south Camellias may be planted any time from early November to late March, but due to the normal human desire for quick effects most planting is done in February or early March when the plants are in bloom. While there are few fatalities among the plants due to this late planting, it is decidedly not the best time to plant. If at all possible make your selections and get your plants in the ground before Christmas. By planting early the cut and wounded roots will heal before spring, the plants will begin immediate root growth and be far better established when the height of the flowering season arrives. Plants that go into the ground early will make much better growth the first year. 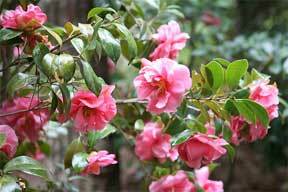 The location of camellia plants on your grounds has much to do with their well-being. Avoid, if possible, locations where the plants will be in full sun all day. In nurseries where an adequate irrigating system is used camellias are often grown in full sun, but placing small plants on the home grounds where they will get the full force of the sun all day is inviting trouble. Not only is the sun damaging to the plants in summer but during the winter as well. If direct sun strikes a plant when it is frozen’ or covered with ice quick thawing can be quite injurious. An ideal location would be under pine trees where there is good light, but where the crowns form a canopy of protection throughout the year. Not many of us have pine groves, of course, but perhaps you can find some spot on your grounds where sunlight filters through the trees to give the desired conditions. If you find it necessary to place small plants in full sun some protection should be provided during the first two or three summers. The soil for camellias should be acid and friable. A good mixture can be easily made by using two parts garden loam, one part of either peatmoss or leafmold and one-half part well-decomposed cow manure. If well-rotted manure is not available you may use a quart of high-grade commercial azalea or camellia plant food to each wheelbarrow of soil. All elements must be mixed thoroughly. Camellias require good drainage and for this reason should never be planted in locations where water tends to stand or where the soil remains wet or soggy for extended periods. As insurance against poor drainage, place 6 to 8 inches of coarse gravel or stones in the bottom of the hole. On top of the gravel place 6 inches or more of the prepared soil and pack it down before setting the plant. The hole should be wide enough to accommodate 6 to 8 inches of the soil mixture between the root ball of the plant and the walls of the hole. Where drainage conditions are good, plant your camellias at the precise depth it grew in the nursery… with the top of the ball of earth which surrounds the roots flush with the surrounding soil level. If the drainage is poor raise the ball above the level for 1 to 3 inches, or even more, depending on the gravity of the situation. Feeding camellias is important. I have had good results from feeding twice each season – first in early spring just as the flower season ends and again in June. I do not advise feeding later than June due to the danger of encouraging new growth that will not have time to harden off before winter. There are several specially formulated fertilizers for azaleas and camellias generally available from most garden supply stores. They are, as a rule, thoroughly dependable and contain sufficient acid to meet the plants’ normal needs. If, however, your soil is above pH 6.5 it would be well to supply additional acid in the form of aluminum sulfate, iron chelates or sulfur. Artificial watering during the dry seasons, especially of young plants, is positively essential in most areas where camellias are grown. During long dry periods soak them once each week, making sure the water runs long enough to reach down to the deepest roots. While these plants require good drainage they also need constant moisture. Watering is especially important during the first 2 or 3 years after planting. Flower buds are formed on camellias in late summer and early fall, and if the plants get too dry during that season buds will not be formed. If there is sufficient moisture after the buds are formed, they will dry up and refuse to open later on. This condition is not noticed in many cases until the flowering season arrives and the buds, instead of developing into flowers, turn brown and drop. Inexperienced growers may at-tribute bud drop to freezes, when the true cause in many cases is lack of moisture during the preceding summer and fall. Maintain a good mulch on all your camellias throughout the year to con-serve moisture. Any one of several materials may be used but peatmoss and pine-straw are favorites. It is very important to water thoroughly before applying the mulch. In addition to con-serving moisture the mulch also makes the planting appear neat. Of the diseases that attack camellias, die-back and bloom-blight are perhaps the most important. In the case of die-back the small branches wilt, droop and die completely. If this should occur cut the diseased branches back to perfectly sound wood and spray the plants with any good fungicide. Bloom-blight causes brownish spots on the petals and may spread to cover the entire flower. If the disease is discovered, pick all diseased flowers from the plant and gather all that have fallen to the ground and destroy them. Then spray with captan and repeat in ten days. If this disease gets a good foothold it is difficult to control. Scale, in its various forms, is the most important insect enemy of camellias. The standard remedy is spraying with horticultural oil, but for the last several years I have been using sprays containing malathion and have had no trouble with scale where the spray was applied two or more times during the season. April and September are choice months for applying sprays.